Justice Peter McClellan has announced that the work of the six Royal Commissioners has begun. He described the task as complex, large and taking time, he pledged to exercise the Commission’s powers to compel production of evidence, even if confidentiality agreements had been signed. He also declared that the Commission would be public where possible and have the “broadest geographical reach”. 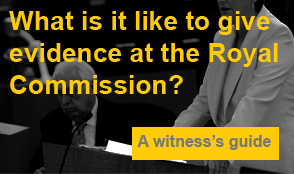 However, he also said the Commission would not make recommendations on compensation for victims.